Now that the big GOP tax plan has passed, let’s have a look at how it may affect the Seattle-area real estate market next year when it goes into effect. Before we start, I want to be very clear up front: I am neither endorsing nor denouncing the tax plan that just passed. To be honest I don’t personally know anywhere near enough about it to know whether it will be good or bad on the whole. If you’re hoping for that kind of analysis, you should look elsewhere. This analysis is merely a narrow look at how some of the specific changes may affect our local market. There are two major changes to the tax code that will matter to home buyers and home owners: the doubling of the standard deduction (from $12,700 for a married couple in 2017 to $24,000 in 2018) and the reduction of the mortgage interest deduction cap from $1 million to $750k. First up let’s look at the doubling of the standard deduction. Here’s an excerpt from a USA Today opinion piece by William E. Brown, president of the National Association of Realtors. In reality, there’s a homeowner tax hike hiding in plain sight. The recent tax-reform framework doubles the standard deduction from $6,350 to $12,000 for single filers, and from $12,700 to $24,000 for joint filers. …the near doubling of the standard deduction means all but the top 5% of American tax filers won’t itemize. That nullifies the incentive effect of the mortgage interest deduction and essentially ends a century-long tradition of encouraging homeownership through the tax code. I’m sure you will be quite surprised to hear that I find this argument to be complete and utter rubbish. Doubling the standard deduction is not a “homeowner tax hike” by any stretch of the imagination. To understand what doubling the standard deduction will mean to home owners, let’s look at an example using some relevant local data. Let’s say we’ve got a married couple making $120,000 a year, buying a house at the overall King County median price (across SFH and condos) of $575,000. We’ll assume that our example couple put 20% down and have an interest rate of 3.90% on their $460,000 mortgage. They would pay an average of $17,100 in mortgage interest per year over the first five years of their mortgage. We’ll also assume that they’re making $4,000 of deductible charitable donations (source), and can deduct $1,400 in state sales tax paid plus $5,800 (1.01% of the home price) in property taxes paid. This gives them a total of $28,300 in itemized deductions. Under the 2017 tax structure, the standard deduction of $12,700 reduces the couple’s taxable income to $107,300, which puts them in the 25% tax bracket. The standard deduction saves them $3,175 in income tax. If they itemize they can deduct $28,300, which will save them $7,075. That’s a $3,900 tax advantage for the home owner who itemizes. Under the 2018 tax structure, the standard deduction of $24,000 reduces the couple’s taxable income to $96,000, which puts them in the 22% tax bracket. The standard deduction saves them $5,280 in income tax. They would still have slightly more to deduct if they itemize $28,300, which saves them $6,226. Still a $946 advantage for the itemizing home owner. To put it another way, it currently makes sense for our hypothetical home owners to itemize if they purchase a home that costs more than about $200,000. Under the new tax structure, that number more than doubles to just under $500,000. 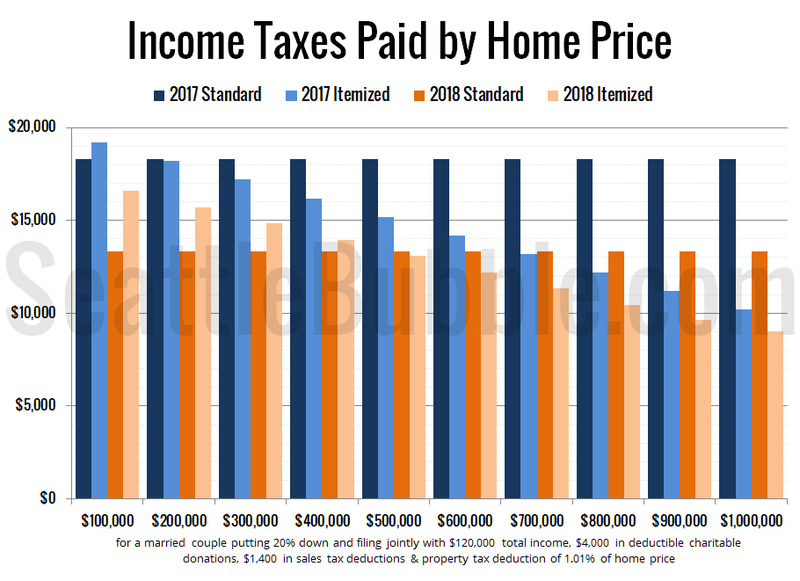 It’s important to note that although the tax savings from itemizing is lower for itemizing the same amount in the 2018 scenario ($6,226 in 2018 vs. $7,075 in 2017) that’s just because the tax rate is lower, which means that the home owner is still paying less of their income in taxes overall. Here’s a graphical look at the total income taxes the hypothetical couple would pay if they itemized the mortgage interest on a variety of home prices. Note: This chart has been updated to reflect the deductions of state sales tax and property tax, which will be capped at $10,000 in 2018). 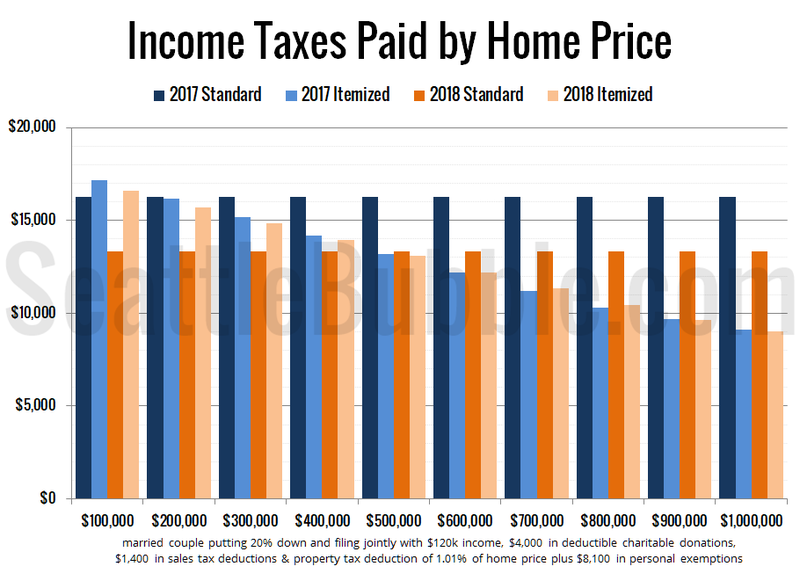 The change to the standard deduction does slightly reduce the incentive for buying a home by eliminating the benefit for itemizing at most home prices below $500,000, but is it a “tax hike hiding in plain sight”? Not remotely. 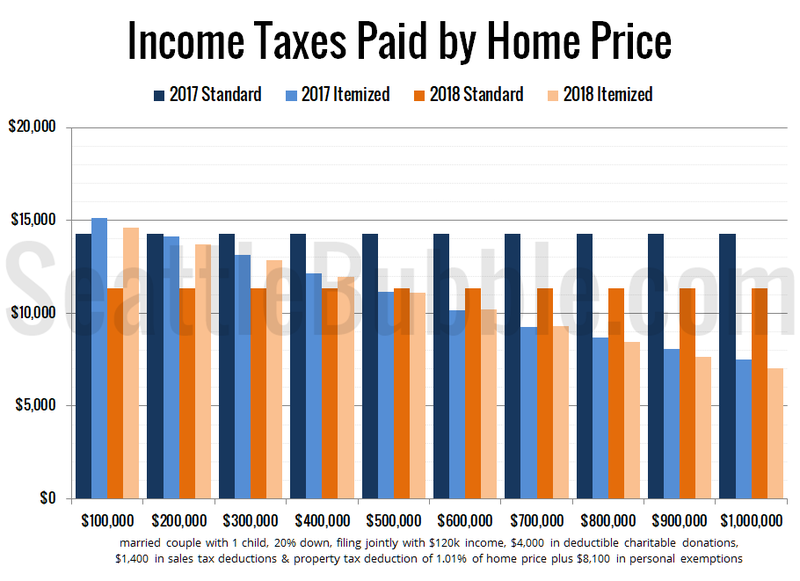 In fact you can see that at every single home price level above, home owners are paying less in income taxes under the new plan with the higher standard deduction and lower rates. I highly doubt that there are many people at all whose decision about whether or not to buy a home hinges on whether or not they will be able to save a couple thousand dollars in income tax after paying over $17,000 in mortgage interest. Personally I don’t think this change will have any affect on the housing market at all. Since this post is getting pretty long, I’m going to split it in two parts. Tomorrow I’ll take a look at the other big change in the tax code: The reduction of the mortgage interest deduction cap from $1 million to $750k. Tim, I heard a few days ago that the new tax plan changed the capital gains on a home sale from 2 years to 5, still $500K. Any word on this. You also must take into account that the 11,300 rise of the 2018 standard deduction brings the deletion of the 4,050 personal exemption, which for a family of three is 12,150. The reduced tax rate barely makes up for it. Nothing but a big YAWN. Don’t get me wrong- any savings is good, but I long for the day I don’t have to pay many hundreds to my accountant to get the stupid paperwork done, not to account for the many hours I have into record keeping and preparation. What ever happened to the flat tax idea- all on a 5×8 postcard? And while we are at it, lets examine getting rid of withholding so that everybody feels the sting of having to write a check. True, but you also need to account for the increase in the child tax credit, which admittedly is narrower than the personal exception which can apply to many more types of dependents. But a $2,000 credit is much better for literally everyone (except may those paying AMT) than a $4,100 deduction. Oh, and BTW, since yesterday when I complained about the media not covering even the increase in the standard deduction together with the end of personal exemptions, two did so, and one was even KOMO which usually isn’t on top of covering tax issues properly. Still in the works. Samples of the cards have been being held up by members of the Trump administration within the past week. But we won’t see that until late January 2019 at the earliest, for the 2018 tax year. Don’t forget the property tax deduction. On the topic of the negative press coverage impacting the public perception of the plan, apparently only 17% of people think that they will actually benefit from it! It’s not just that a plurality of respondents in a new NBC News/Wall Street Journal poll say the cuts are a bad idea (41-24, with 35 percent unsure or holding no opinion), or might have bad long-term effects. It’s that only 17 percent actually believe they’ll get a break. Now part of that is that people don’t understand taxes very well. The average person doesn’t understand the difference between a tax deduction and a tax credit. And part of it could be listening to the partisan nonsense of the party they believe. And finally, part of it could be just the huge unpopularity of Trump and members of Congress. A huge part of it though is the completely biased reporting on the tax bill. Although maybe it’s not bias. The members of the press are also not terribly bright, so maybe they actually believe the misleading material they’ve written. It will be interesting to see it public opinion starts to change in February when payroll withholding decreases. I suspect it won’t because the press will search out those few who don’t get a reduction in withholding and then claim they are typical. Just for future reference, or for those who have not been covering this site due to the lack of new posts, this portion of the comments (400 on) from the last thread largely covered these tax issues. Yes, the tax deduction limit is probably a bigger change for most people. It will be easy to tell if it affects you by looking at your 2017 return. If you have over $10,000 of state and local tax deductions (including part of your car tabs) it will impact you. Otherwise not. And yes, I think the 2 of 5 to 5 of 8 change did survive, but NAR was claiming some sort of a victory in that area–not sure what it would be. They also somehow didn’t mention after the bill passed that they expected property values to drop 10% as the result of the bill. Amazing how propoganda becomes no longer useful when misleading people is no longer important! Also don’t forget the sales tax deduction. With these two deductions added it should be over $24,000. It took me a while to figure out Tim’s graph, so for the benefit of others who also didn’t get it at first glance . . ..
Where the itemized tax is higher than the standard deduction the taxpayer would take the standard deduction. So for 2017, the crossover for the hypothetical couple is around the $300,000 range (which I assume is probably $260,000 of mortgage debt). For 2018 it’s somewhere between $600,000 and $700,000 (something over $500,000 of mortgage debt). Kmac is right. This is just more of the same. The tax code should not be used as a vehicle to execute on purchased legislation and modify behavior. If it is, you wind up with the mess we have today. Tomorrow I’ll take a look at the other big change in the tax code: The reduction of the mortgage interest deduction cap from $1 million to $750k. So does your bar graph not factor this in? If not then it’s kind of misleading. I was expecting to see a difference at the $750K+ range. I can understand if you’re saving that part for tomorrow, but maybe there should be a note on/near the graph that this is not factored in. How do you do this whole analysis and leave out the personal exemption, property taxes, and sales taxes? On this fictional couple, that is probably another $15,000 in deductions (8+5+2). I’m reading that was changed at the last minute to appease the Realtor lobbyists, but not seeing a good credible source for that yet. The source I am seeing said there is no change on that. Trying to verify now. As to Brian’s comment, the hypothetical couple is not affected by the MID reduction. As to uwp’s comment, I have my doubts about the graph too because it does seem like too large of a jump in the amount of debt necessary to itemize. Rounding, before they had the standard deduction of $12,000 and personal exemptions of about $8,200, for a total of just over $20,000. Now it’s about $24,000. So the only real difference for the hypothetical couple is roughly $4,000. [Edit: See correction below] Off the top of my head, nothing else has changed for them, but rates and rates won’t affect the decision to itemize. With basically $4,000 more of itemized deductions needed before itemizing make sense, seemingly the difference in mortgage debt would be only about $80,000 rather than the $240,000+ indicated as I explained in post 8. Seems clear to me that Washington, thanks to no state income tax, will see little to no impact from the tax changes on the housing market. Maybe a slight shift at the breakpoint in price where 750k in deductible interest and 10k in property tax are felt? Nah, probably not. Market too hot with too little supply for a couple thousand to make a difference. If anything, this might add more support to the market. Why? Californians will feel the pinch more than Washingtonians. CA state income taxes are a nightmare, coupled with hefty property taxes on new sales due to price. Anyone on the fence in CA might pick up and head north. Thanks for the feedback, everyone. I’ve updated the post to include consideration of itemizing deductions for state sales and property taxes. I haven’t considered the personal exemption in this analysis because exemptions not deductions, and are calculated completely separately from itemized deductions. Therefore they are not related to the question of how buying a home and itemizing affects your tax bill. It does now, but the difference is pretty tiny. Note that it’s only mortgages above $750,000 that are affected, and if you put 20% down on a $1M home, your mortgage only just barely exceeds that threshold at $800,000. In the updated chart in the post, the taxes paid for a buyer of a $1M home are $9,033. Without the $750k mortgage interest deduction cap that amount would be $8,768. So we’re talking a difference of a whopping $265. Peanuts for someone buying a $1M home. I’m going to have to change some things I’ve said. The personal exemption doesn’t impact the decision to itemize because it was taken even by people who don’t itemize. It’s just not on the first page of a 1040. So the difference for the hypothetical couple would be more in the $12,000 range, which would be about $240,000 of mortgage debt at 5% interest. That’s consistent with what is indicated in the graph. The end of the personal exemptions only affects the tax paid–so doubling the standard deduction is not such a big deal. That’s consistent with what I noted. What’s odd is all the Google searches I’m finding for text of the bill are 6 days old. There have been at least 5 changes to the bill since then, but none of the ones I heard of were related to the sale of residence issue. Yes you are right about that, but one must consider the entire picture and how they personally relate to it to weigh the outcome. Unfortunately, you may be on to something about CA folks incentivized to heading north (I shutter writing that). Also, unless you are talking big ticket items ( home remodels or new construction) actual sales tax isn’t all that consequential from the deductibility standpoint. In fact, I am usually better off using the “optional sales tax tables” that allocates a prescriptive sales tax deductible based solely on income level. A couple with AGI of 90-100k and 3 exemptions can take a default sales tax deduction $1106. I think you would have to spend some serious coin to exceed that, not to mention save all of the receipts proving it. In my case I would make copies of those receipts so I could keep them in their respective categories, but also easily prove from a sales tax paid point of view without having to go through ALL of my records. Like mentioned earlier, overall it is nearly a wash for many- all things considered. RE: Kmac @ 19 – Don’t forget about the sales tax on a car purchase. That alone would easily exceed $1,106. It’s been a while since I itemized, but I think you can add that to the tax table amount, so you don’t need to have receipts for the other items. RE: Kary L. Krismer @ 18 – Confirmed, no change on tax free gains on primary residence last 2 of 5 years. Flippers carry on. But a flipper isn’t typically one who holds for two years….. Strange how the numbering on the posts replied to gets skewed when someone’s comments are held for moderation and then slipped in. thanks people, I too only found aged tax posts. I’ve enjoyed reading this blog for years. That is probably because all of the media types have already confirmed their biases and have presented the negatives that they feel compelled to present. For those asking about exemptions, here’s a version of the chart that takes the elimination of personal exemptions into account. It reduces the taxes paid in the blue 2017 bars without affecting the orange bars. The difference between buying or not in 2018 is unaffected. And just for good measure, here’s what it looks like if the hypothetical couple has one child. In 2017 they can claim a $4,050 exemption (reduces taxable income) and a $1,000 credit (directly reduces taxes due). In 2018 the exemption is eliminated but the credit is doubled, so net effect is close to zero. In any of these cases there is no big change for home owners next year. The only thing that is really affected is the home price threshold at which it makes sense to bother itemizing, which stays the same whether you consider personal exemptions and child tax credits or not. RE: Judy @ 1 – This didn’t make it into the final bill. It is still 2 years. RE: Kmac @ 23 – True, flippers don’t usually hold for two years, but I knew one guy who would do this. Build a house, move his family in for two years then repeat. Very transient way to live. It was amazingly difficult to find a current version of the tax bill, but I think I did it. The 2 years to 5 years change was apparently stricken. It was probably a good idea, but given the nationwide inventory issues, it had really bad timing. I’ve done that several times myself. I have come to the conclusion that the savings in the taxes is BARELY worth the hassle of moving, living out of boxes, listening to the other household members complain about the ongoing situation and the moving / re-establishing expenses. And that isn’t accounting for any of the loss of regular income during the time dedicated to building a new house. Thanks Tim for helping clarify this. Glad to hear that. It was a dumb idea for the market right now. Thank you, that was very good. Hopefully it’s accurate! One mistake I noted is there is an exception for mortgages incurred after December 15, but it apparently requires a binding contract written before that date that had a closing date before 1/1/18 and an actually close before April 15. One thing they pointed out I hadn’t thought of is the withholding mess created. Withholding is adjusted by claiming personal exemptions, but those are going away. Still the number of dependents does impact taxes. For 2018 they can still use the old rules, with adjusted amounts. This is slide 24 of your link. Anyway, that means people should see reduced withholding for 2018, but that might change in 2019. And the withholding for 2018 might be less accurate, leading to people owing taxes! Verified in #17 in the link. Even though the House and Senate approved the 5 year, looks like the Realtor lobbyists successfully had that pulled out at the last minute. No change. I have many clients including my next one and two of my three previous ones in 2017 who sold in less than 5 years, but are not flippers. The bigger significance is that having to hold longer would have reduced inventory even more than it already is as many selling in 3 or 4 years would have waited. So good news for sellers as to no gain tax and good news for buyers as to not another crimp on inventory. 4. eliminate allowable interest for HELOCs. 5. although abandoned, they voted to squeeze folks on the holding period too. Five negatives for homeowners in one tax cut? Does the Donald want to be your landlord? Well, why not. And me too. We know that non-homeowners, at least, should have a little more cash. Some of that could go to rent. The value of owning your home may have gone down for you; but the value of owning your home hasn’t gone down for Donald and me. This is going to be an interesting year in tight markets like the Puget Sound. I think that’s consistent with the Republican position of not coercing/enticing people to do things through tax policy. Rather obviously though they pick and choose when they think that way. I’m a bit surprised that the tax credit for buying an electric car survived. Rather obviously though they pick and choose when they think that way. That is not consistency on their part. The interest and tax deduction treatment is entirely inconsistent with how other real estate is treated. Seeking to reign in the capital gains exclusion here is not consistent with unqualified basis step up for estates. Elimination of the $4,000 exclusion for working people is not consistent with retaining (on a growing schedule) the $5million+ exclusion for estates. The 40% reduction in corporate taxes (let alone liability limitations) does not “entice” that sort of investment? Edited to eliminate some unintended, but probably offensive knee jerking. Elimination of the $4,000 exclusion for working people is not consistent with retaining (on a growing schedule) the $5million+ exclusion for estates..
Well, first I don’t think I was saying they were consistent. Just the opposite. But as to your points . . . The elimination of MID and RE taxes on houses would be entirely consistent with the way personal expenses are treated (non-deductible). Remember they wanted to totally eliminate SALT and the House (or maybe Senate) wanted to reduce the MID to $500,000. So they were trying to reign in those exceptions to the general rule more than what they accomplished. So they were trying to be more consistent than what they ended up being. The $4,100 personal exemption has nothing to do with estate taxes, and was likely more related to the doubling of the standard deduction and the increase in child tax credit. RE: Kary L. Krismer @ 40 – I think the two key messages survive. 2. When you buy your house, it’s personal; when I buy your house, it’s business. We can pretend that it’s not the same asset. Some people here will do that, and think they’ll get a lower price because they and other people in their situation have lost some benefit to owning it. But investors haven’t lost any benefit to owning it. This will be ironically most impactful in the starter market. RE: Kary L. Krismer @ 6 – Nice analysis. I always respect that the host doesn’t pick sides or get caught up in the hysteria. My question concerns mostly relative tax differentials between jurisdictions. By capping the State and Local Tax deduction to $10K, Washington State becomes more “competitive” and attractive when compared to places like NY, CT, NJ, IL , OR and CA. I suspect that especially in high income strata, there will be a significant flight at the margins as people flee higher taxes but also the turn in real estate markets that threaten embark on long run structural decline. Places like Florida, Texas and Washington might profit as the proceeds from these sales wash up at our shores and further bid up or already frothy property markets. Declines in real estate prices in these high tax burden markets could create a spiraling feedback loop by which the flight could actually accelerate as considerations to leave become more urgent in order to get ahead of a declining market. Meanwhile inelastic supply and tight inventories in the desirable markets make price spiking there even more acute. In addition motivating flight from high tax burden real estate markets, the tax differential will persuade relocations from other regions and markets to favor the lower tax jurisdictions over high tax places. Doggone it, Washington State can be thankful to that other Washington for a tax reform putting more wind in its sails by making it more relatively competitive especially compared to its Pacific rivals to the south. Any analysis about how corporate tax changes will specifically impact local businesses, employers and their willingness to invest and create jobs in the region? Other than the general cyclical effects that better investment conditions and more capital repatriated from overseas that will affect all regions according to the magnitude of their local economies, I’m stumped about how Washington state will profit from the lower corporate tax more or less than other regions. In terms of absolute magnitude, a large booming economy with HQs of profitable corporations will see more benefits compared to marginal and peripheral regions. Also regions with a large concentration of global businesses that have been stockpiling profits overseas waiting for this reform will get a sudden rush from the repatriation of these. So regions especially dominated by the America’s most competitive industries, e.g. finance, pharmaceuticals, IT software & service, will benefit most from this particular effect. From a regional perspective, the first round effects & benefits of the corporate tax reform will benefit most the regions that are already thriving. For marginal and peripheral regions, the best hope is for subsequent effects by which businesses are motivated to invest in capital and facilities that create jobs and increase productivity and labor compensation in those areas. People in King County gripe about their property taxes. Of course we could argue about the wasteful spending, but I don’t know how much they appreciate how low the taxes are here because we don’t have to pay for generations of legacy costs that some of the more established but declining regions bear. Just for fun I looked up on Zillow the property taxes for a median priced home in the ordinary suburban county where I lived when I was a kid back east. That median priced home there is worth $450K but property taxes are >$12K per year. So even if principal and interest payments amount to about ~$1600 per month, the property tax adds more than an extra $1000! Then add the 5 – 7% in state income taxes, and that SALT deduction capped at $10K is small consolation. No wonder nobody sticks around there after their kids finish school. RE: Green-Horn @ 43 – RE: Green-Horn @ 42 – Quite frankly I haven’t thought much about regional competition for new business. I believe Washington is relatively attractive, particularly outside of Seattle where traffic, Amazon devouring everything and an unfriendly city government would be huge negatives. As to our RE taxes being low, part of that is a constitutional limitation. Also as to your comment about other states having higher RE taxes, they might also have an income tax, and the $10,000 limit is a combined limit. Inventory is collapsing. It’s below 1,400 right now (King County SFR). I wonder if people were holding off due to the tax bill, or if it’s just the holidays? Average CDOM over three months, median over two months. Its going to be a big change in blue states. I think the prospect of much higher tax bills in blue states may also be what has driven the King county inventory tracker down to 1328. This tax fix is fantastic. My taxes will go up but I’m expecting higher dividends and stock appreciation to counterbalance that. The effect on the American economy will be profoundly positive. Not the tax cuts in isolation, but rather, in combination with other Trump policies. His intent is first to stop the influx of cheap labor and social expenses through immigration reform; this will cause labor scarcity. This would be bad for businesses, except that second, the corporate tax cuts will more than offset that. Those two factors together will cause wage inflation, i.e. drive up American wages, but without chasing businesses out of the country. The higher wages will pull more US labor in off the sidelines. Workers will rejoin the economy in order to take advantage of the hot economy and newly lucrative wages. Many will drop from Medicaid and long-term disability entitlement programs, which is where they went to hide under Obama. With a brighter future, the opioid addiction problem will subside somewhat in our youth. High-tax blue states will lose their SALT subsidies, driving up taxes on their wealthy. This shifts the tax burden to where it belongs and forces them to streamline their bloated government programs. Young people will opt-out of Obamacare payments and penalties, returning their freedom to them and eventually destroying expensive Obamacare entitlements. Attempts to forcibly maintain costly social programs will fall on deaf ears in the Federal courts, thanks to Trump’s record-breaking appointments. In sum, this tax reform is just one facet of it: He’s stemming illegal immigration, reducing addiction, and reversing escalating social costs. He’s energizing the national economy in a way that everyone can participate. He also drove ISIS out of Syria and Iraq, and nobody even talks about that. Trump truly is making America great again. He may turn out to be the finest president of our lifetime! Gee- and I thought all those Californians moving to Washington State were doing so because of our warm sunny dry winters? I suspected that you wouldn’t be able to prepay your real estate taxes in Washington. The tax rate cannot be determined until all the assessments are completed because the rate requires knowing the total value of all assessments, and that doesn’t occur until after the first of the year. This confirms my suspicion. Excellent work Tim! Most everyone is overestimating the effect of these changes on RE. Anyone who looks at those histograms you produced would realize that. RE: Blake @ 51 – There’s also the rather complicated Alternative Minimum Tax to consider. That’s probably more of an issue here than in states with higher taxes, because here someone with SALT over $10,000 is more likely to have had to pay AMT under the old system, and that didn’t allow deduction of SALT items. So their SALT (and mortgage interest) may have already been limited under prior law. Disclaimer–AMT confuses the hell out of me and apparently others too! Whoa man, that article was way too heavy on facts and reason. We can’t have that. The American populace is far more comfortable rolling on the floor with stiff-body temper tantrums. Actually, they might get less if they are married and had more than one kid or another dependent. But beyond the fooling people thing (which I agree with), it also drops the number of people who itemize. I think that was one of the goals–for many reasons–some good and some bad. 2. When you buy your house, it’s personal; when I buy your house, it’s business. We can pretend that it’s not the same asset. Actually, in most transactions it would be personal on both sides. It would only be business if one party was buying or selling a rental. And what it is for one side doesn’t determine the other. If you go to buy a new D.R. Horton house for your new home, that doesn’t mean the transaction is personal to D.R. Horton. BTW, the reason personal expenses are not generally deductible is pretty simple. If you could deduct personal living expenses for most people there’d be nothing left to tax! The top 20% [mostly rich elite ] from Sanctuary States mainly eat cake! No more “limitless” welfare to the rich elite cry babies open border Progressive Minority. Hades, ya pay tax as a low income hamburger flipper, ya see a tax elimination or decrease under Trump and it came from the rich elite mortgage welfare. So Kary…. come February the poorest 60% of Americans (those making $40,000 or less) “may see” a reduction in withholding on their bi-weekly paychecks of between $5 and $30. (I put that in quotes, because most will not even notice it!) And you think they are suddenly going to slap their foreheads and decide that they support this tax cut? The media is reporting the Democrats saying that the tax cuts favor the rich and that the poor get “crumbs.” And the media keeps reporting statements from Republicans that this is a “middle-class tax cut” that does not benefit the rich… which is fake news? So… is it really surprising that only 17-33% of Americans say they support this tax cut? … yeah, blame it on the corporate media! Trump is the highest IQ President on record [check it out]. He’s 2-3 steps ahead of the Mueller Investigation [now turning against Mueller] and the MSM looks like the Fake News we’ve all grown to HATE. The Dems’ NWO is TOAST. Yep–that is a significant amount of money to people making so little money. I suspect they will notice it. But the relatively small amount back for most individuals, including those with incomes up to say $100,000, is part of the reason I’m more skeptical of the stimulative impact of individual tax cuts as opposed to corporate tax cuts. These stats are meaningless absent also showing how much they currently pay on average. Why don’t you show a figure for the bottom 40%? Or those in the bottom 40-60 percent range? Is it because you realize that the bottom 40% pays nothing in income tax or even gets money back? And with the newly expanded child tax credit they may get even more back. Given that it would be very hard to have a system where the bottom 60 percent gets a significant amount back. The bottom 40-60 percent though might be a considerably different number. Don’t overlook the impact of SALT caps on construction cost. I am days away from breaking ground on a new residence. The 10% sales tax on new construction is no longer deductible. That’s an extra 3% cost for all new home buyers. Since new homes are likely to be impacted by the lower mortgage caps as well, it all adds up to new housing stock being even more expensive. Further accelerating the tight housing market in Seattle. Not to mention how attractive we just became relative to income taxes in the bay area. Of course the dollar impact decreases are not comparable to the Middle Income; use the % drop impact. Their tax cut is about 0.5% to just over 1%! You think $10-60 PER MONTH is really significant and will change their minds? And as for that CNSNews article you posted… They point out that the poorest 40% don’t pay any income tax and then claim that they get all those transfers from Social Security and Medicare so the bottom 40% pays “negative 9.1 percent in federal INCOME taxes..” Somehow they left out all the PAYROLL taxes these people pay for Social Security and Medicare!! That simply dishonest… but it is standard BS from the the far right-wing CNS. You’re really scraping the bottom there with CNS Kary… I thought you were smarter than that. Intellectually dishonest much? Or do you not know the meaning of the word meaningless? I did not suggest that they are incorrect, only that they don’t tell you much of anything. As to the rest, if you can’t see the bias in the press that merely means you share their bias. I was careful to point out that it was income tax, (“Is it because you realize that the bottom 40% pays nothing in income tax or even gets money back?”) and have in the past pointed out that low-income people get hammered on Social Security tax because it gets paid on the first dollars. But you’re not going to change that fact with a change to the income tax laws. Also I’m not sure Social Security would ever be changed to change that for two reasons: (1) Social Security needs the money; and (2) Low-income people do very well when it comes time to collect benefits. More of the same here in 2018? Where is the inventory! I have been arguing with my wife, who wants to buy a home in this overpriced market. With the $24,000 standard deduction, I have new ammo. If you are currently a renter, there is no longer a tax benefit to buying a home, given you get the large $24,000 standard deduction as a renter. Throwing additional interest expense into the mix doesn’t increase your deduction. Unless you are sure home prices will appreciate, the option of renting just got a lot more attractive because of the new tax benefits for renters. Many people are worried this market is overpriced, at a time when the Federal Reserve is increasing interest rates, so I believe this new tax law change will significantly impact RE demand, at least in the low to mid range. Congressman Ken Buck is blowing the whistle on the real-life House of Cards in our nation’s capital. Elected in 2014 as president of one of the largest Republican freshman classes ever to enter Congress, Buck immediately realized why nothing gets done in Congress, and it isn’t because of political gridlock—in fact, Republicans and Democrats work together all too well to fleece taxpayers and plunge America deeper into debt. Throwing additional interest expense into the mix doesn’t increase your deduction. If you look at the graphs, you will see that starting at the 500k mark, all things given, there is a tax benefit to itemizing on Schedule A interest expenses. Everyone “exposes” the problems but NOBODY does anything to further correct them…. I’m not so certain about that. Corporations will be subject to limits on interest expense deductions from income, as can be seen in the following paragraph from the 2017 TAX CUTS AND JOBS ACT. The limitations are severe, namely the sum of items A+B+C below. My guess is that for a typical incorporated landlord, A=0 B=notbig C=0. I’m not a tax lawyer, but it looks to me like the ability to deduct mortgage interest from income will be severely limited for corporate landlords, and maybe even more so than for regular homeowners. 10 SEC. 13301. LIMITATION ON DEDUCTION FOR INTEREST. 23 such taxpayer for such taxable year. 25 shall not be less than zero. RE: Justme @ 67 – I’m not sure where you’re getting that text–I’m not seeing it in the final tax bill. I’m also not reading that as being a limitation, assuming business income is gross receipts. It might keep the taxpayer from claiming a tax loss for the year, maybe. What I had read about interest was that they were going to limit corporate interest deductions, but more in the context of startup financing. Not an area I followed at all beyond reading that one article. RE: Joe @ 65 – Buying a house is a very personal decision. You are probably among the minority who evaluates it like a business transaction. I am with your wife even though I consider this market bubbly. But if you plan to stay in the same house for 30 years, you should not have to time the market. Thanks for the heads up on the swamp book. Just ordered it from the library. RE: Justme @ 69 – Schedule E is the real estate income schedule. It has its own rules. Only the net number comes through to the primary return. You don’t deduct your real estate interest or taxes in the primary form. People don’t generally use c-corporations for holding investment real estate. Often times a c-corp will hold even it’s operating real estate through an LLC. Both the pdf files contain the text that I am quoting. What reference are you using? The new law does not say, AFAICT, that the certain types of corporations are not subject to the changes to USC Title 26 Section 163(j), nor that certain types of interest, such as mortgage interest paid by “landlord” corporations of whatever type, is excluded from the restrictions on interest deductions. The tax law also does NOT refer to specific tax forms such as schedule E, and whether an itemized deduction is accounted for in some particular tax form or other. Not being a tax lawyer, there may be more to this than I understand, but I think it is entirely possible that my understanding is correct. By all means prove me wrong, but not by reference to certain tax forms that may or may not reflect the new law. Note: beware that I have another comment in moderation, and that this comment almost surely will not be comment 75 in the end. Could be 76, could be higher if other comments are also held up by moderation. People in WA don’t know how good they have it financially. I recently sold a house in NJ and bought a house in Seattle. The two homes were within $10,000 of each other in value. It seems funny you would think that the Trump tax reform would contain a provision that would be about the most harmful thing one could do to Trump. My counsel would be: get ready to be disappointed. Probably more cogent to the argument that SFR investors are not being hampered by this provision is that they are seldom corporations at all. The schedule E in question is usually in a personal return, and changes to corporate taxes are wholly irrelevant. I don’t think the language “Washingtonians don’t know how good they have it…” is appropriate. When people move here with that attitude, they try to equalize the difference between here and there. Then we become New Jersey lite and everyone is complaining that it is becoming just like New Jersey. I am under the premise that the cost of government shouldn’t be an extremely heavy burden. It’s think it is more appropriate to say “New Jerseyans are being unbelievably screwed”. Leave your baggage at your state line. I still think it’s more that people who live in denser areas take more advantage of government services and thus want more of them. If King County had a two-week power outage the people of Seattle would suffer more than the people in rural areas, because they are more dependent on services. That leads to them being more willing to pay for services and more willing to pay taxes. In other east coast news, Cuomo is trying to scramble to allow people to pay RE taxes early, but that’s apparently not possible everywhere there. He also thinks he can make other adjustments to their taxes in the future to help, but I don’t see how that is possible since the limitation is on all state and local taxes combined. The only thing he could do to help is reducing taxes. The first and third of your links are prior versions–not sure about the second. I was using the final version as passed Congress. All the pdf files referenced, INCLUDING the one the reference you most recently posted, Kary, contain the SAME language that I previously quoted. SEC. 13301. LIMITATION ON DEDUCTION FOR INTEREST. ‘‘(C) the floor plan financing interest of such taxpayer for such taxable year. The amount determined under subparagraph (B) shall not be less than zero. 1. when you refer to something, PROVIDE A LINK FOR REFERENCE. Right away. Both Kary and I should have done that, but at least I provided the verbatim text in question, containing a filename and a date. 2. Just because a certain pdf of a certain bill does not LOOK exactly the same, whether it is formatting, line numbers or other ornamentation, or the presence or not of administrative prefaces, does not mean that the contained language of the proposed law is automatically different. RE: Justme @ 82 – Maybe I did my search with a typo–as I recall I searched for “business interest” and nothing popped up. This analysis seems to miss the point. The question should be: will people buy in the first place, or continue to rent? In the past there was pressure for people to buy because rents were going up, but rents are going down… Now it’s just speculative behavior. People are buying because they think prices will continue to rise. It’s not about whether they will make the decision to buy or sell, but merely whether this change in tax law will impact that decision, and if so, by house much. There are many reasons that people decide to buy. Rising rents was just one of them. Speculation is just one of them too (although RE isn’t a great asset for pure speculation). But there are many other reasons, and at the current moment not that many opportunities (active listings).